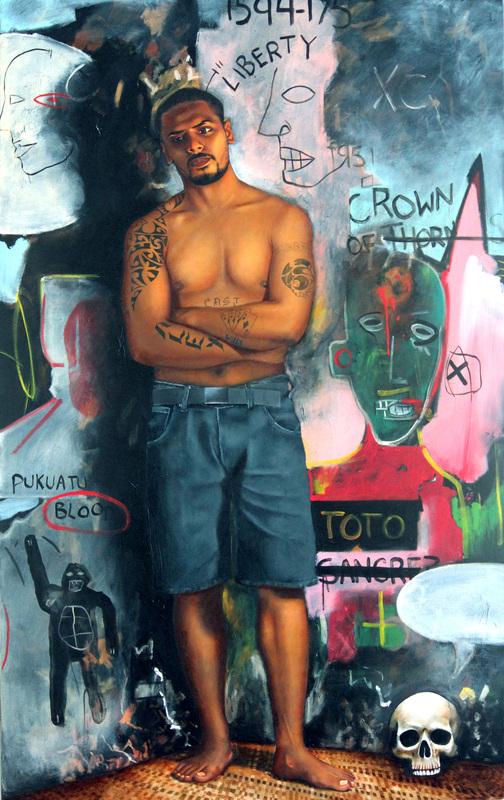 A young Cook Island man who came into my life through building our house in Rarotonga 2012. His personality struck me from the first time I met him, when he laughed the sound captured and diluted any troubles within reach of his laughter. Ioarama has been in and out of the court system in New Zealand and Rarotonga, and at one point had news paper articles in the Cook Islands saying he was not wanted here. This painting and the intention of this painting was to capture his spirit while also creating a dialogue about placement and belonging. There are several references in the painting to the traditional Russian Orthodox Three bar Cross. I am always interested in looking at the life and sufferings of Christ in relation to our sufferings, we all have our cross to bare. The background also references Jean Michel Basquiat, and his painting "In Italian". This work is the beginning of a new series of paintings I am currently working on. 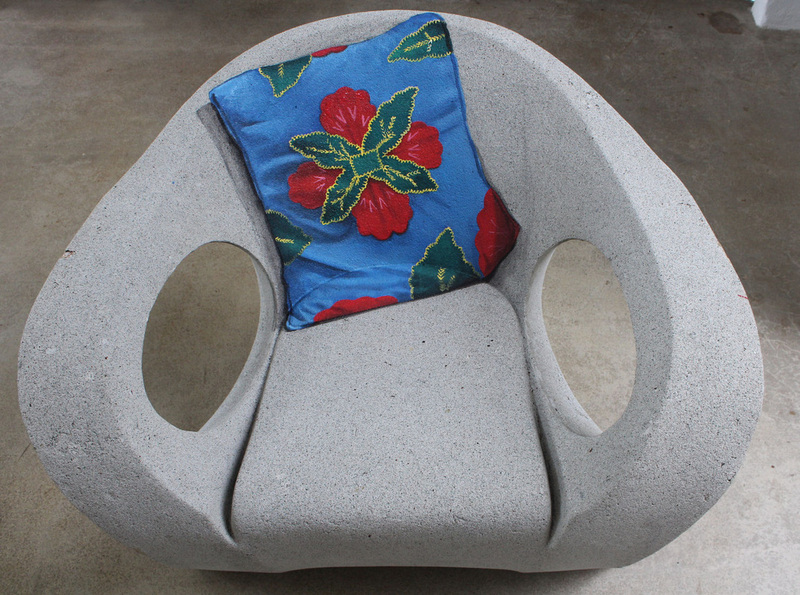 A commissioned job of painting three outdoor concrete chairs. 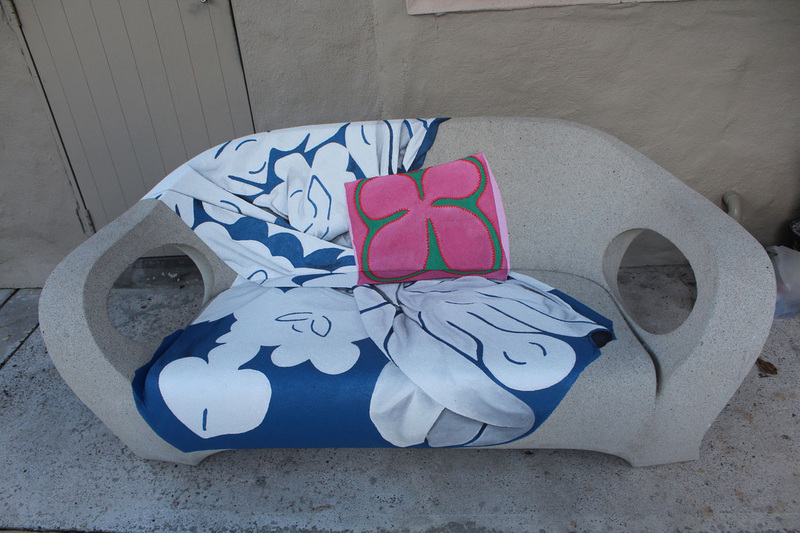 Job outline was to create splashes of colour on the chairs which represent the Pacific without going over board. We decided on a Tivaevae blanket for the double seater and Tivaevae pillows for the two single seater chairs. (Tivaevae) in the Cook Islands Tifaifai in French Polynesia is a form of artistic quilting traditionally done by Polynesian women. The word literally means "patches", in reference to the pieces of material sewn together. The tivaevae are either made by one woman or can be created in groups of women called vainetini. The vainetini use this time together to bond, sing and catch up on village news. Every November in Rarotonga is the annual event of the Vaka Eiva. The around the Island Paddle race with over 1000 paddlers from around the Pacific converging on Rarotonga for the week long race. 2013 marks the tenth year anniversary of the event. The Art Studio in Arorangi Rarotonga has held a paddle exhibition each year to coincide with the Vaka Eiva race, this year with over 20 artists having contributed, each displaying one or more painted or carved paddle. This was my paddle for 2013, showing the Waka Tapu, Te Aurere the first traditional waka hourua (double hulled voyaging canoe) built by Hekenukumai Busby. 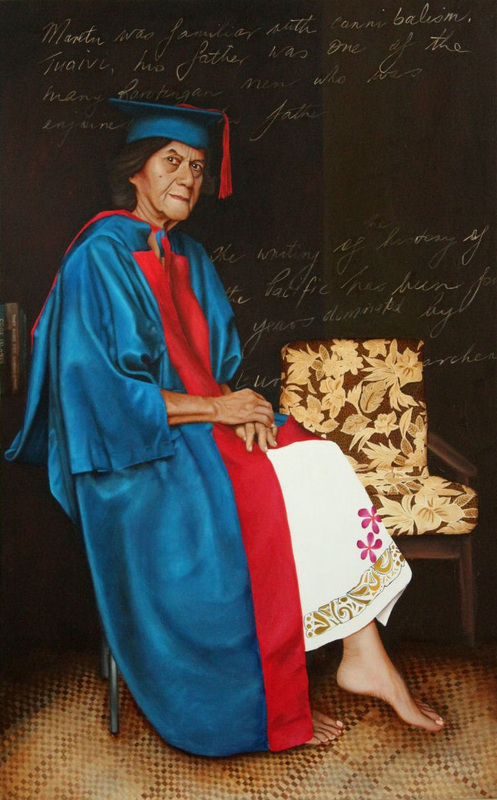 Completed commission for the University of the south pacific in Rarotonga of Marjorie Crocombe O.B.E. who was recently awarded Doctor Of Letters, for the University of the South Pacific.